Cherrytrees is a magical walled garden in the Scottish Borders which makes an idyllic backdrop for an intimate country wedding with exceptional charm and style. 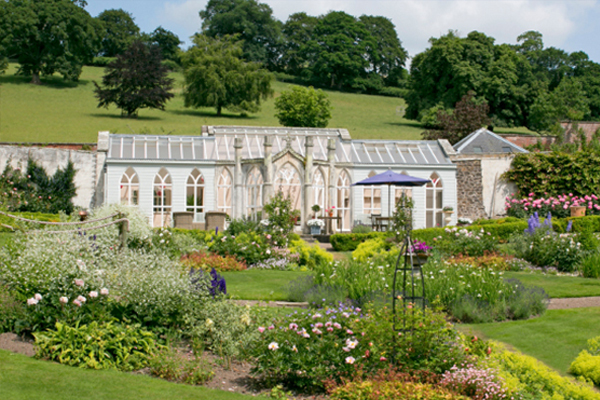 This secret gem of a garden includes a beautifully appointed Victorian conservatory and terrace, providing an elegant country setting for a wedding ceremony with up to 48 guests. The beautiful drawing room in Cherrytrees House can be used for a drinks reception, followed by dinner for up to 48 guests in the conservatory. Catering is informal yet sophisticated, with hog roast, beef and lamb available direct from the owners, and seasonal vegetables and herbs sourced from the Cherrytrees garden. Cherrytrees can be booked for weddings from May to September, with the garden at its most enchanting during the daytime. The borders supply cutting flowers for table settings and bouquets – see Get Knotted’s wedding flower designs for inspiration. Contemporary terrace furnishings include chic sofas and two braziers, and there’s also the option of heading to a local hotel for a cosy evening gathering at specially discounted rates. Cherrytrees sits in the hills around a mile from the small border village of Yetholm, and has inspirational views across to the Cheviots. Boutique-style accommodation is available close by, and Yetholm and Kelso makes a lovely base for exploring the beautiful countryside of the Scottish Borders and North Northumberland.